ATF is responsible for enforcing federal law with regard to the sale and use of alcohol, tobacco, firearms, and explosives. Although the ATF itself was created in 1972, at that time making it the youngest tax-collecting office of the Treasury Department, its roots go back to the founding days of the Republic. The order of items in its name corresponds to the order in which Treasury began to assume control over the items themselves: alcohol in the post-Revolutionary War era, tobacco around the time of the Civil War, and firearms during the Great Depression. Alexander Hamilton, the first secretary of the Treasury, suggested that Congress impose a tax on imported spirits to pay a portion of the debt incurred in the War of Independence. Congress passed a resolution calling for such a tax, and in 1789 gave Treasury responsibility for collecting it. An act passed in 1862 created the Office of Internal Revenue, whose responsibilities included the collection of taxes on spirits and tobacco products. Renamed the Bureau of Internal Revenue (BIR) in 1877, in 1886 it established a laboratory that in time would assume responsibility for analyzing a variety of alcohol and tobacco products, as well as firearms and explosives. 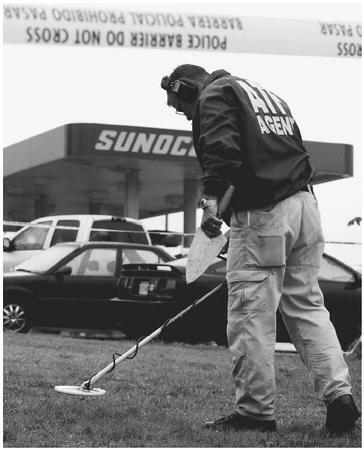 An Alcohol, Tobacco, and Firearms (ATF) agent searches for clues at a Manassas, Virginia, gas station in 2002 as part of the search for a sniper that terrorized the Washington, D.C. area. associated with organized crime led to the passage of the National Firearms Act in 1934. Four years later, Congress passed the Federal Firearms Act, and BIR became responsible for collecting taxes on firearms. After a number of changes in the section of BIR concerned with alcohol taxes, in 1940, this division became the ATU, or Alcohol Tax Unit. In 1942, Congress gave ATU responsibility for enforcing the Firearms Act. ATF separates from the Revenue Office. Throughout much of the twentieth century, BIR had included a Miscellaneous Tax Unit (MTU), which had responsibility for tobacco taxes and, between 1934 and 1942, taxes on firearms. In 1952, MTU was dismantled, and its firearms and tobacco tax functions fell under ATU. At the same time, BIR received a new name, one familiar to millions of Americans today: Internal Revenue Service (IRS). ATU then came under IRS control as the Alcohol and Tobacco Tax Division, an arrangement that lasted for two decades. In 1968, when Congress passed the Gun Control Act, the old BIR/IRS laboratory became responsible for analyzing firearms and explosives, and the Alcohol and Tobacco Tax Division became the Alcohol, Tobacco, and Firearms (ATF) Division. The 1970 passage of the Organized Crime Control Act made the role of the ATF Division more explicit, and signaled a shift away from IRS purview. On June 1, 1972, the Treasury Department issued Order No. 120–1, which separated the ATF from the IRS. The order gave the new bureau authority not only over the three items listed in its name, but also over explosives. During the 1970s, ATF and its laboratory became involved in arson investigations, and in 1982, Congress amended Title XI of the Organized Crime Control Act to make arson a federal crime and formalize the ATF's role in investigating it. During the 1990s and the beginning of the twenty-first century, ATF undertook a number of new efforts toward fighting and investigating crime. Among these was the Integrated Ballistic Identification System, a computerized program for matching weapons and ammunition fired from them. In the mid-1990s, after its abortive 1993 raid on a Waco, Texas, compound controlled by the Branch Davidian cult, the bureau became the focus of hostility on the part of fringe right-wing groups. By the turn of the century, ATF annually collected more than $13 billion in revenue for the federal government. Moore, Jim. Very Special Agents: The Inside Story of America's Most Controversial Law Enforcement Agency—The Bureau of Alcohol, Tobacco, and Firearms. Urbana: University of Illinois, 2001. A Report on the Bureau of Alcohol, Tobacco, and Firearms: Its History, Progress, and Programs. Washington, D.C.: U.S. Government, 1995. Vizzard, William J. In the Cross Fire: A Political History of the Bureau of Alcohol, Tobacco, and Firearms. Boulder, CO: Lynne Rienner, 1997. Bureau of Alcohol, Tobacco, and Firearms. < http://www.atf.treas.gov > (December 30, 2002).